"I am the rose of Sharon, and the lily of the valleys" (Song of Solomon 2:1). In the Song of Solomon, the rose of Sharon is mentioned as a flower that is dear to the king's heart. This intertwining of a delicate rose embracing a cross will remind you of how precious you are to the heart of the King of Kings. 14K solid yellow gold cross pendant with Rose center made in 14k solid rose gold. Cross measures approx. 1 1/8" tall. With hoop/bail approx. 1 1/2" tall. 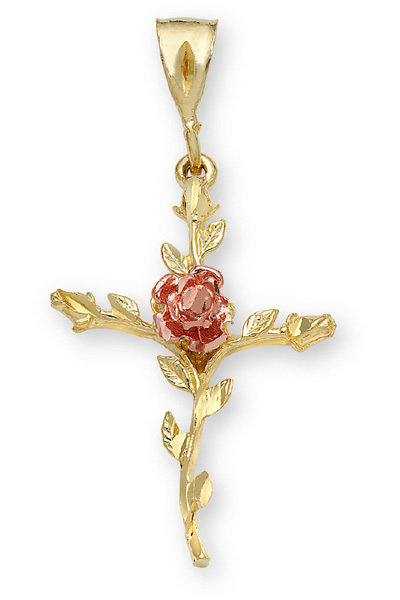 We guarantee our Rose of Sharon Cross Pendant in 14K Gold to be high quality, authentic jewelry, as described above.